. . . Has she turned down Strive’s offer?
. . . does she not need a house, $1000 per month?
. . . is her Mbare story fake? CYCLONE IDAI has made a heroine out of a mystery granny whose love drove her to donate a sack of valuables to the victims. What made granny stand out was not the worth of the donations in her sack or even her age, but the story that went round about how long she had walked with the sack on her head. The story that went round said Gogo had walked from Mbare to Highlands (almost 20 kilometres) and that drew a lot of empathy for Gogo and turned her into an instant heroine. Highlands Presbyterian Church Facebook Page was the first to post about Gogo’s love. 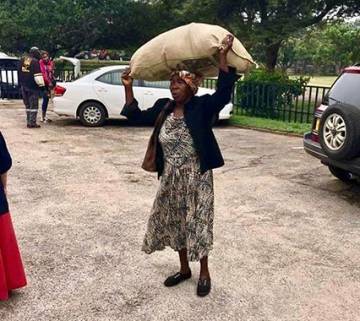 They put a picture of her with the sack on her head and captioned it: “This gogo had no 50c for combi, walked the whole way from Mbare to Highlands just to donate her pots to give to people in chimanimani. PTL”. This was on March 19 and today, exactly a week later, Gogo is still trending. After that revelation, everyone wanted to know who Gogo is and what drove her to make such a personal sacrifice. Everyone wanted to know why she had left other organisations nearer Mbare that were willing to forward her donation to Cyclone Idai victims. Star FM are receiving donations and are literally a stone throw from Mbare. Why did Gogo not pick this option? People wanted to know. So Gogo, especially on social media, became the most wanted person in Zimbabwe. But it was yesterday that the search for Gogo intensified after reports that business mogul Strive Masiyiwa was looking for her to build her a house in an area of her choice plus a further pledge to give her $1000 monthly allowance for her upkeep. “When this (Cyclone Idai) is over, I’m going to find her, and invite her to come and see me, if possible: Then: I will spend time in prayer with her! Then I will BUILD HER A HOUSE, ANYWHERE SHE WANTS IN ZIMBABWE! It will have solar power and running water! 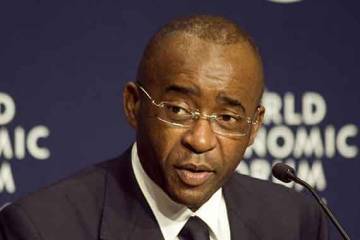 Then: I WILL GIVE HER A MONTHLY ALLOWANCE OF $1000 for life!,’ pledged Masiyiwa as he responded to one of his Facebook followers who had asked what he shall do for Gogo. A few hours later Chicken Hut, through their twitter handle, claimed they had located Gogo. “Thank you Zwitter…We located Gogo We feel you should know, Gogo Mutsonziwa is grateful for everyone who has shown their support and Ubuntu towards the #CycloneIdai In her words ” the moment I accept publicity and gifts her (sic) gesture is no longer for God”. #goodheart #Zimbabwe” they tweeted. What did their tweet mean? Did it mean Gogo had turned down an offer from Masiyiwa to get a house and $1000 monthly allowance for life? One of their followers even asked the question and the response was, “We are respecting what she told us…” and then later, “We cannot answer on her behalf”. Gogo has clearly stated she is not willing to talk to the media as this, in her eyes, is akin to glorifying her sacrifice and gift for men’s praise. She wants to give for God. There is a twitter user who even suggested that Gogo’s whole story is fake and she never walked from Mbare but owns a house in Avonlea and even drives. He called her Gogo Mutsonziwa and claimed she lives 200m from his home. That claim only helped to make Gogo more mysterious and if true, it would turn a whole church’s Facebook post into a lie. Gogo has time to reflect on the offer from Strive because he will only look for her when the world is done assisting Cyclone Idai victims and Manicaland is built anew. Meanwhile we wait, and as this story unfolds, the call for aid in Chimanimani and other affected areas is still loud and urgent.